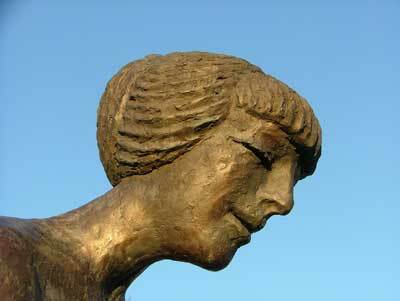 The alluring sculptures of Olbram Zoubek, in Litomyšl, Czech Republic. Olbram Zoubek started studying sculpture soon after World War II. He was one of Czechoslovakia’s leading artists until he began to be persecuted by the totalitarian authorities during the period of “Normalization” (following the 1968 invasion by fellow Warsaw pact countries). Being unable to enter public competitions or even exhibit, he turned to restoration work, came to Litomyšl and spent 20 years restoring sgraffiti patterns on the chateau. During this time he was part of the artistic underground that opposed the communist regime. After the fall of communism in 1989, new president Václav Havel was often photographed in his office with one of Zoubek’s sculptures keeping watch over his shoulder. 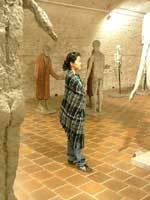 There are three places in Litomyšl to see original Zoubek sculptures and by far the most numerous are in the old brick cellars of the renaissance chateau. If you’re walking in from the bus station though, your first chance to see Zoubek originals will be on the otherwise drab pale blue house close to the tourist information office on the main square. The window on the top floor has representations of Adam and Eve in Zoubek’s characteristic style forming the two pillars between the three panes of glass. The entrance to the gallery in the cellars of the heritage-listed chateau is from the west side of the main building (around to the left as you face the main courtyard from the entrance). And one of the sculptures stands outside to help you find your way. The 20Kč entrance fee is payable in the small office and from there you will descend a long, wide staircase into the first of the five rooms. It’s so chilly down there that they might offer you a blanket to wrap around your shoulders while you wander among the crotchety old men and beautiful long-haired women that inhabit Zoubek’s imagination. The sculptures are displayed in such a way that you can walk around and in between and study them from any angle you would wish. The pleasant and subtle aromas of oak and wine permeate the entire space and there’s no time limit to how long you can stay down there. The cellar gallery is open May to September Tuesday through Sunday, and in April and October on weekends and holidays only. 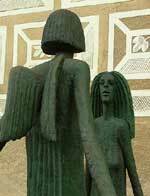 But perhaps the most dramatic place to see Zoubek sculptures is at the fountain in the monastery gardens. The fountain is a shallow rectangular pool recessed below ground level and four figurines stand at the end of four small pedestals, one on each side of the pool. The pedestals are like short diving boards, and the figures seem to be deciding whether to dive in or to dance to the music playing gently in the background. Another figure stands off to the rear of the fountain and you can easily walk up and touch, hug or dance with any of them.